Anyone can tell you he's a first-rounder, but who is Lars Eller, really? For starters, he was the second European player chosen at the 2007 NHL Entry Draft and one of only two non-North Americans selected in the opening round that year. A big centerman who can put points on the board, the book on Eller hasn't changed since draft day. "Our evaluation of this young player is still the same," said Habs GM Pierre Gauthier via conference call following the trade. "This is a player who has always been projected to be a second line center." Watch: Halak's best save of the playoffs? A playmaking pivot who was busy honing his skills in the Swedish Elite League before making the jump to the AHL this past season and even making his NHL debut with the Blues, Eller is a player Gauthier has high hopes for. "I think Lars is almost ready to contribute for us as early as this year," revealed Gauthier. "He's been developing nicely, we watched him excel at the AHL level and with his experience now in the NHL. He's a big centerman with a good shot who really competes." Still months away from the opening of training camp, Gauthier is already anxious to see how things will unfold. "For any team there is nothing better than having young players who are knocking on the door," said Gauthier. "Some will progress faster than others, but I think our good group of veteran players will also be ready to help our young guys along." After wishing Jaroslav Halak all the best, Gauthier picked up the phone to speak to his future center. 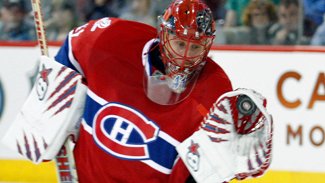 "He knew all about the Canadiens and what it means to play here," said Gauthier. "He's excited to be with us."